A fall can happen in a moment’s notice, before you can even blink. 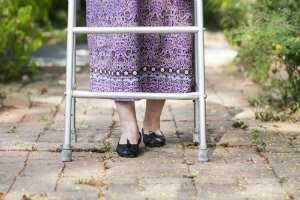 It can happen to anyone at any age, but as we get older the risk of injury increases. In fact, the Centers for Disease Control and Prevention (CDC) report that falling is the leading reason for injuries among those who are over 65. Some of these injuries are life threatening. The reality is that fall-related wounds and fractures can be painful, require hospitalization, decrease mobility, and significantly impact a person’s quality of life. Austin Foot and Ankle Specialists is committed to educating our patients and community about the best ways to reduce falls and fall-related injuries. There are many tools and prevention strategies that will help you avoid a life-changing fall. Proper foot care and a solid foundation are paramount in these efforts. Similar to building a house on a solid foundation, paying attention to your foot health and footwear will enhance your stability, confidence, and help to prevent injury. When your body has the ability to maintain its center of gravity over your legs, ankles, and feet--you can maintain a stable upright posture and reduce your risk of falling. For patients who complain of imbalance, weakness, neuropathy, ankle joint instability, and ankle osteoarthritis, a balance brace ankle-foot orthosis (AFO) can be very effective in preventing falls. This type of brace helps to restore ankle function, to compensate for balance deficits, and to improve confidence, all of which reduce the risk of falls. The brace is lightweight, and easy to wear, since there are no laces and latches. Extra padding and a cushioned footplate also provide further comfort. Your choice of footwear is another major factor in building a solid foundation. Sensible shoes should fit your feet well and have non-skid soles. Steer clear from high-heeled shoes. They often lead to unsteady footing and increase your chances of rolling your ankle. Always tie your shoelaces and be very careful with your choice of house shoes—slippery soles can cause a fall. Socks can pose the same problem, especially if you have hardwood or tile floors. In addition to the foot care tips we have mentioned, there are some modifications you can make at home. Make the effort to arrange furniture so there is always a clear pathway. Keep clutter and cords off the floor and stairs, and secure any loose rugs with a slip-resistant backing or double-sided tape. Use nightlights to provide enough light in hallways or walkthroughs, and install handrails on both sides of stairways in your home. Place rubber mats inside showers or tubs, and consider a handrail here as well. Remember to always store items within your reach. If you or someone you know needs help implementing some of these fall-prevention strategies, do not hesitate to contact Austin Foot and Ankle Specialists for help. We can evaluate your risk factors, provide treatment for current foot conditions, and discuss ways that we can help you avoid a fall-related injury. Dr. Craig H. Thomajan DPM, FACFAS and Dr. Shine John DPM, FACFAS are trusted foot specialists who provide excellence in podiatry throughout Central Texas. Call our office at (512) 328-8900, or request an appointment online.